Making floor routines flow | | Swing Big! Today I’m going to talk a little about floor routines. Specifically what happens before kids tumble. 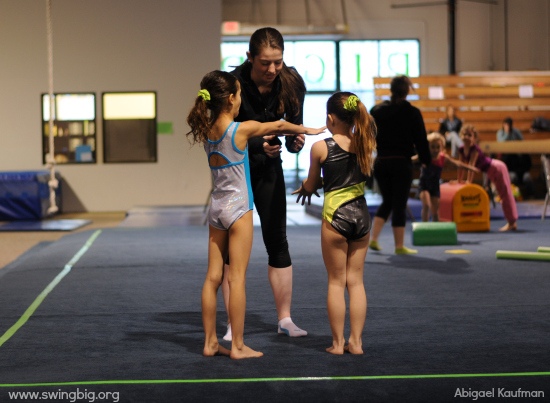 How many of you have gymnasts that stand in the corner and huff and puff and possibly shuffle their feet before they tumble in their routines? I’m guessing a lot. It’s a really common problem. That being said, I don’t think it’s by any means unfixable. While this may not be something that we want to implement in JO the idea of getting gymnasts used to not standing forever before their tumbling is a good one. Mary Lee Tracy put up this video of “into and out off” on floor. I know a lot of people use this concept on beam, but using it on floor can dramatically improve the flow of your floor routines. Try it out and let me know what you think.